HOUSTON, Oct. 3, 2018 /PRNewswire/ — Boomtown Oil and Rocky Creek Resources are pleased to announce their discovery well, the Five Star 1H, in the Lavaca Trough along with two additional recently drilled wells, the Kloesel 1H and Shiner 1H. Rocky Creek Resources is a joint investment between Boomtown, Juniper Capital Advisors, and Delago Resources focused on the Eagle Ford and Austin Chalk formations in Lavaca and DeWitt Counties. 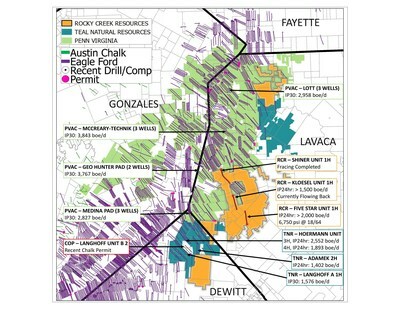 Find out more news about Boomtown Oil and Rocky Creek Resources at https://www.eagleford.com.